MANILA, Philippines - The Low Pressure Area (LPA) at east southeast of Surigao City has developed into a tropical depression and was named 'Agaton,' state weather bureau PAGASA announced in its 5:00 p.m. update on New Year's Day. 'Bagyong Agaton,' the first tropical cyclone to enter the country this 2018, is expected to make landfall over Caraga area tonight or tomorrow early morning, January 2. At 4:00 p.m. today, the center of Tropical Depression 'Agaton' was estimated based on all available data at 175 km East Northeast of Hinatuan, Surigao del Sur (09.0 °N, 127.8 °E). 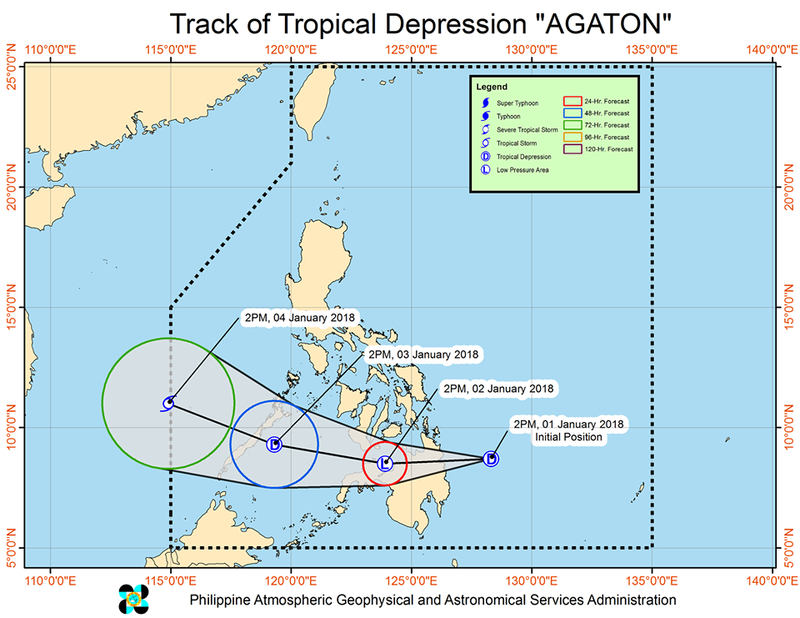 'Agaton' has maximum sustained winds of 45 kph near the center and gustiness of up to 60 kph. It is forecast to move West at 19 kph. Tropical cyclone warning signal (TCWS) No. 1 (30-60kph expected in 36 hrs) has been raised in 17 areas: Southern Leyte, Surigao del Norte including Siargao Island, Surigao del Sur, Dinagat Island, Agusan del Norte, Agusan del Sur, Davao Oriental, Davao del Norte, Davao del Sur, North Cotabato, Compostela Valley, Misamis Oriental, Misamis Occidental, Lanao del Norte, Lanao del Sur, Camiguin and Bukidnon. PAGASA said moderate to heavy rains is expected over Bicol Region, Visayas and Mindanao particularly in the regions of Eastern Visayas, Caraga and Davao. Residents of these areas must undertake precauitionary measures against possible flooding and landslides and coordinate with their respective local disaster risk reduction and management. Meanwhile, sea travel is risky over the areas under TCWS #1 and seaboards of Northern Luzon and Southern Luzon, eastern seaboard of Central Luzon, and eastern and western seaboard of Visayas due to the surge of the Northeast Monsoon.